As the temperatures outside become milder, many stargazers make their way outside. In the Spring, the night sky shows us a very different side of itself. What is there to observe? What is worth the time and effort? 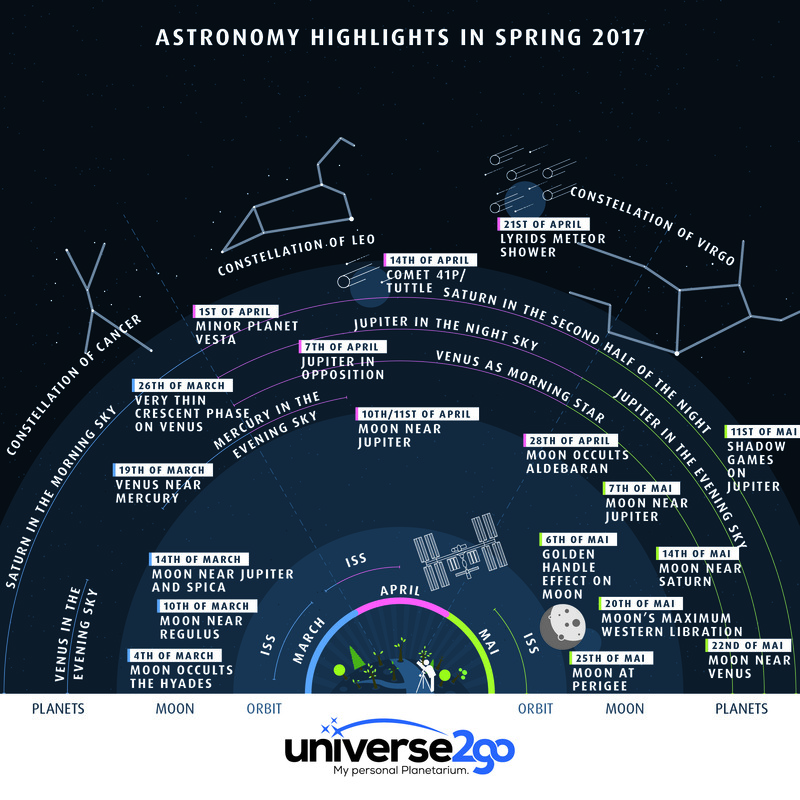 Our astronomy highlights infographic for Spring 2017 can show you at a glance, what to keep an eye out for during the next three months, from March to May. During dusk, the crescent Moon will rise, illuminated at 12% and waxing. Three days prior was the new Moon and the crescent offers a vivid glimpse of the Mare Crisium. Still there is more to be seen here in a trio of planets – Mars, Uranus and Venus. Occultations of celestial objects by the Moon are always interesting and are all the more fascinating when the Moon is not fully illuminated, thereby occulting the object with its non-illuminated side. On the 4th of March the Moon will travel across the open star cluster of the Hyades and thereby obscuring the 3.6 mag bright star 54 Tau. For European observers, the star will disappear behind the non-illuminated side of the Moon just before 9 PM GMT and reappear at the other side just before 11 PM GMT. In the evening of the 10th of March, the almost full Moon will rise in the East, as the sky darkens. Just above it, the constellation Leo and its brightest star Regulus. At the beginning of the evening, the two will be about 1.6° apart. However, shortly before midnight our satellite will move within 1° of Regulus. From here, you will be able to observe how the Moon slowly travels across the night sky. Quite a sight indeed: on the 14th of March, we will see the Moon in close proximity to Jupiter and Spica, the brightest star of Virgo. The only good chance to view Mercury during the evening this year, the smallest planet will be visible from now until the 10th of April! As of the 19th of March, we will be able to discover the Sun’s closest planet extremely close to the western horizon. Need help finding it? Just search out Venus and approximately a hand’s width away, you will find Mercury. Venus reveals itself in her perfect form, subtle and crescent-shaped, the planet will appear just above the horizon, and only 1% illuminated. The most fascinating part is that this event will take place during the day. Warning: the Sun will appear very close to Venus, so avoid looking directly into the Sun. This type of observation is best left to the experienced astronomer. Mercury will be approaching its easterly elongation, occurring on the 1st of April, meaning the planet will descent in the dusk following the Sun and will appear as a half-illuminated disk. Mercury will now set later, than on the 19th of February, and be an easy object to identify in the night sky. The sight along with a crescent Moon at 3.6% illumination will provide a great opportunity to capture the essence and atmosphere of the evening! In January, the minor planet Vest stood at opposition and was visible throughout the night. The class 7.6 planet will be easily visible in the constellation Gemini, almost half way between 69 Gem and 77 Gem. On the 6th of April, the gas giant Jupiter will be in opposition to the Sun. Rising just at dusk, the planet will be visible throughout the night. Photo tip: Photograph Jupiter this year, as the gas giant will be roughly 30° above the horizon, just below the celestial equator, and will not reach a higher position for the next few years. The almost full Moon will approach Jupiter, at 1.1°, during the night of the 10th and 11th of April. The comet 41P/Tuttle-Giacobini-Kresak will approach the Earth, and be easy to view through a telescope. During this year’s pass, a respectable increase in brightness is predicted. According to the Minor Planet Center, the comet will increase to a 6.7 mag bright object from the beginning to the middle of April. Moreover, it will appear high in the sky as a circumpolar object and travel from mid-April through the constellation Draco, until it reaches Hercules by month’s end. The Moon provides a helping hand by being in its darker phase. The Lyrid meteor shower will peak on the 21st with 10 to 20 meteors per hour. While the optimal observation time is between 10 PM and 4 AM, the Moon will cause little disturbance. The radiant, so the origination of the shower, lies within the constellation Lyra. For European observers, a thin Moon cicle will occult the star Aldebaran in the constellation Taurus at 8 PM. On the 28th, the occultation will occur during sundown. Approximately 50 minutes later, around 9 PM, Aldebaran will appear on the other side of the Moon. The morning star Venus will shine bright in the sky once again. With a brilliance of -4.8 mag, our second planet will appear just before sunrise. The Venusian cicle will then be illuminated at 26%. A golden handle on the Moon? You can find it as a matter of fact. A ring of light will appear on the dark area of the Moon’s surface. It always appears, when the waxing Moon is illuminated at 83% (around 4 PM Central European Time, 10 EST in the USA). Within the Mare Imbrium, the plain Sinus Iridum will connect. This plain is encircled by Montes Jura range. While the valley between remains in darkness, the rising Sun will illuminate the peaks of the mountain range, the spectacle of the “golden handle”. Another way to put it: Alpenglow on the Moon! During the night of the 7th into the 8th of May, the Moon will once again approach Jupiter, reaching a separation of only 1°. Tonight, we will be sitting in the premium seats. Before us on stage: Jupiter and its moons. In a short on the night of the 1tth to the 12th, we will witness the moons Europa and Io leave their shadows on the gas giant. First, Europa will travel across the planet’s disk around midnight (central European time). At around 1:40 AM, the moon’s shadow will transit across the planet. Then at 3:13 AM, Io will dance in front of Jupiter. Its shadow will then follow shortly before 4 AM (CET). We will then see two shadows on the planet, one on each side of the gas giant. Ensure that you have a good view of the horizon during this event, since Jupiter will be sitting just above the horizon around 4 AM. This evening, the great red spot of Jupiter will be easily observable. Around 9:40 PM, the spot will appear from behind the planet and wander over a four-hour period over the planet’s disk. Four days after the full Moon, a lunar meeting with Saturn will take place, with a separation of 1.6°. For astrophotographers, this can be a very interesting project – capturing the libration of the Moon. The Moon will find itself in its western libration. A strong eastern libration will take place on the 31st of May, during which you see more of the Moon. Capturing it in a photograph will surely be a fine experience. Shortly before sunrise, we will witness a beautiful constellation of Venus and the Moon at a separation of 6°. The Moon will show itself as a cicle, illuminated at 19%, with a new Moon three days later. The new Moon will be at a distance of 358,000 km (222,500 miles) to Earth, making it the closest distance of the year. Today, the Moon will be at 1.5° of separation from the star Regulus. Available as JPG and PDF. Enjoy stargazing and clear skies!